As soon as the weather starts to get a bit colder I start thinking about cosy comfort food. Pasta bakes are top on my list when it comes to comfort food. This Vegetable Pasta Bake is a family favourite and comes with a very cheesy crispy topping, perfect comfort food. It’s packed with veggies in a tasty, herby tomato sauce and is perfect for the weekend. 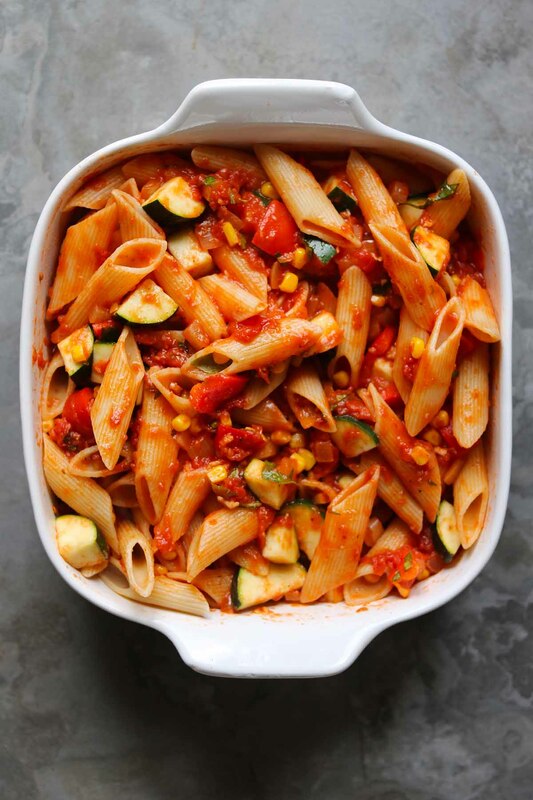 You can, of course, choose your own veggies for this vegetable pasta bake, peppers are great as is courgette, just don’t cut the courgettes too thinly or they will disappear. Mushrooms would work well too, particular white button mushrooms, mild in flavour they won’t overpower your pasta bake. The tomato sauce is the glue that holds this vegetable pasta bake together, it’s packed with flavour and just the right consistency. I add a dash of balsamic vinegar and a hint of chilli flakes for more depth of flavour but these are optional. You can, of course, add more chilli if you wish, I like to keep it subtle for this. Now that cheesy topping, start with the sharp mature cheddar, then creamy mozzarella finally add in crispy breadcrumbs and salty vegetarian parmesan and you have a seriously tasty topping. Add this to the crispy edges of the pasta and hello comfort food! Now, this is a treat so if you want to cut down on some of that cheesiness then you could skip most of this and just have mozzarella. That will work just perfectly but hey this is comfort food, go all out. Can I Freeze This Vegetable Pasta Bake? For best results freeze the pasta bake before baking, and before adding the topping. Cook the pasta al dente, if it is cooked fully or overcooked it will be mushy once defrosted and cooked again. Leave the pasta and sauce mixture to cool completely before freezing. Place in a freezer safe dish or bag and label. Add the cheesy topping once the bake has been defrosted and bake as per recipe. For optimum results, I recommend freezing the sauce separately, before you add the basil. Defrost fully, reheat the sauce add the basil and check the seasoning. Cook the pasta fresh then follow the recipe instructions from there. A tasty vegetable pasta bake packed with veggies. With a rich tomato sauce and a very cheesy topping, this is perfect veggie comfort food that the whole family will love. Preheat the oven to 200 degrees C / 392 F Please note I use a fan assisted, electric oven. Please adjust according to the oven you have. In a large saute pan heat the oil over a medium heat. Add the onion and cook for 10 minutes, stirring occasionally. Once the onion is translucent and a little bit soft add the garlic, oregano and chilli flakes and cook for a minute. Pour in the tinned tomatoes, add 150ml of water to one of the empty tins, give it a little swirl to gather up any leftover tomato juice then add that to the pan. Stir in the tomato puree and balsamic vinegar if using. Finally add the bay leaf, thyme, salt and pepper and leave the sauce to simmer over a reduced heat for 10 minutes. After 10 minutes add the courgette, pepper and sweetcorn to the sauce, stir well then leave to simmer for another 10 minutes. After 10 minutes add the basil then check the seasoning. Cook the pasta according to the packet instructions minus 2 minutes. You want the pasta to be slightly undercooked. Once cooked drain the pasta then tip it into a large casserole dish. Pour over the tomato and vegetable sauce and mix well. In a small bowl mix together the breadcrumbs and the vegetarian parmesan cheese. Evenly sprinkle the cheddar cheese over the top of the pasta, place the mozzarella over the cheddar. Finally, cover the pasta and cheese with the breadcrumb mixture. Bake in the oven for 25 to 30 minutes or until the cheese is bubbling and the breadcrumbs are golden. Remove from the oven, leave to cool slightly then serve with a green salad and /or garlic bread. Calories are approximate and are based on 4 portions. For the pasta, I used pennoni rigati but penne, rigatoni or fusilli would work well too. To make this recipe gluten free, substitute regular pasta for your favourite gluten-free pasta and substitute the panko breadcrumbs for gluten-free breadcrumbs. If you wish to make this a vegan recipe then substitute the mozzarella and cheddar for similar meltable vegan cheese. You can omit the vegetarian parmesan and add a little nutritional yeast in its place. Please note however that I have not tested this recipe to be vegan these are just suggestions to try. To cut down on time you could make the sauce a day or two ahead. Just keep it in the fridge until you are ready to use it. This pasta bake can be stored in the fridge for 2 days then reheat until piping hot. This pasta bake looks so incredible! I love that it’s chockful of veggies, just how I like my dishes!! And the cheese on top? Perfect! A hearty, healthy dish. I’ve always loved the combination of red sauce, noodles, and veggies. I didn’t forget cheese!! It warms me up on the coldest winter days and is perfect to share with family and friends. I love baked pasta topped with cheese. Absolute comfort food. Love how simple and easy this is. My kids would really enjoy this very much. Pasta and cheese is my go-to! This looks like my ideal weeknight dinner! This sounds like the perfect fall comfort dish and you make it look so easy! Definitely going to have to add this to our menu for next week. This Vegetable Pasta Bake is perfect for these chili weeknights! My family will be piling on seconds for sure. What a marvelous dish — your photos are absolutely gorgeous. A fitting tribute to your delicious vegetable pasta bake. I simply love pasta with sauce and then add cheese — I’m in heaven. I really like that you added all of those wonderful vegetables. This recipe is a keeper. This looks so good, and a perfect, comforting meal for the cold weather. Thank you also for detailed tips on freezing this dish! This pasta bake is a great dinner option for a busy weeknight! I love everything about it and I know my family is going to love it! Looks super tasty. I do love a pasta bake and the addition of plenty of veg and a generous topping of cheese is always a winner for me.